Hi, I was just wondering if you could give me any advice about my 2 year old cocker spaniel. Just recently she has been barking at strangers on walks and other dogs. At first, I thought she was just doing this to protect me but tonight she lunged towards a strange dog which was very excited and bouncing around. I do put her on the lead when other dogs are around so thankfully they were both okay. I am not sure how to correct this behaviour though as I do not want any more incidents like this to occur as I did find it quite upsetting. Do you have any ideas on how to sort this out? I had major problems from day 1 with my cocker barking at night and waking the whole household up including the neighbours. He is now six months old, things got so bad it had got to the point when I considered re-homing him. I searched the internet for answers and came across a device which attaches to his collar. When the dog barks it activates a fine mist that dogs hate. This has stopped the barking in its tracks. I only attach the collar overnight, it should not be left on for more than 12 hours. There are 100s of 5 star reviews on this product, it deserves every one. The collar is sold online by Petsafe. A qualified dog behaviourist will get to understand your dog's problem better and determine the root cause for the change in behaviour. I'm not a dog behaviourist, but I may be able to help a little. When a dog barks and lunges at other dogs there's often a good chance that it's done out of fear or anxiety. The good news is that you can work on this and hopefully change her aggressive reaction to other dogs. Here's how. If your dog is quiet, (and she hasn't tried to bark or lunge at the other dog) praise her and continue with the treats then walk her away from the other dog. Feeding her treats in this way will teach your dog to think that 'good things happen to her when other dogs are around' and that they're not a threat; there's nothing to be frightened of. You'll need to practice this as often as you can and at some point you will feel comfortable about allowing the two dogs to get closer. Perhaps you can ask a fellow dog walker for assistance while you're going through this. If they understand what you're doing, I'm sure they'll want to help. 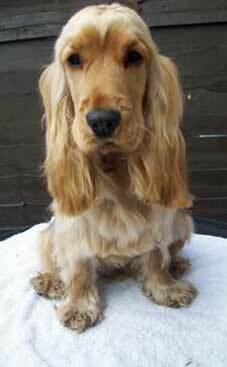 Initially, you will need to be far enough away from the other dog so that it doesn't trigger a barking response from you Cocker Spaniel. If she's already barking this won't work - you will need to be further away and try again. If you see another dog and you don't have any treats, try to avoid the other dog by either turning and walking in the opposite direction or hiding behind a building or bush. You might feel a bit silly, but you don't want her to practice this 'barking behaviour' while you're training her. Dogs learn behaviours by 'practicing'; the more they 'practice', the more they will do it. Don't make the mistake of 'stiffening' when you see another dog because your anxiety will be transmitted to your dog. She will pick up on it and react to it by barking. Stay calm.